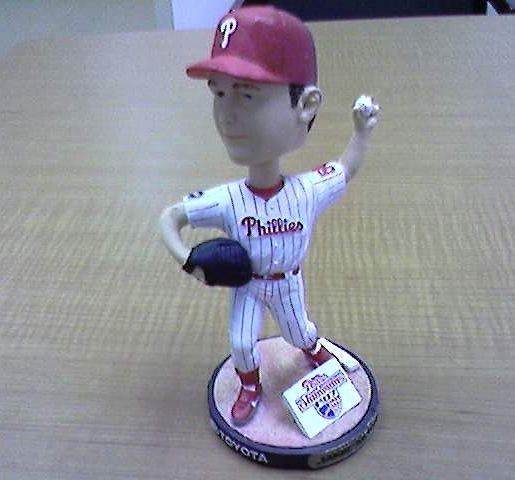 This Jamie Moyer bobblehead has the pitching velocity of actual Jamie Moyer. To say that Jamie Moyer is old is an understatement. At 49 years and 150 days old, Moyer has been in Major League Baseball since breaking in with the Chicago Cubs in 1986. Since then, the left-handed Moyer has been on the most unusual journey of any professional athlete ever. He’s never had a dominating fastball, and as the years go on he’s lost more velocity than maybe anyone ever, yet he’s still pitching. Not only is he still pitching; he’s still winning. Jamie Moyer became the oldest pitcher to win a game in the Majors last night, when the Colorado Rockies beat the San Diego Padres 5-3. Moyer went seven innings, gave up six hits and two unearned runs, and never broke 80 on the radar gun. That’s right, he won the game throwing stuff that would be out of place in fast-pitch softball. He had Tommy John surgery on his elbow in 2011 and missed the entire season, yet he’s back now. While he hasn’t been great, he’s been consistent and about the same as he has been for the last two decades. For Jamie Moyer, at this point, showing up is incredible, let alone showing up, pitching well, and winning. Sure, anyone can win a game once, but Moyer’s been doing it for decades with nothing more than movement, control, and placement.